How do you get high schoolers from low-income families to care about two men shooting at each other on a riverbank more than 200 years ago? A six-week program from the Gilder Lehman Institute is using performance art, virtual reality and a very special trip to the theater to teach 5,000 students across the U.S. about founding father Alexander Hamilton. 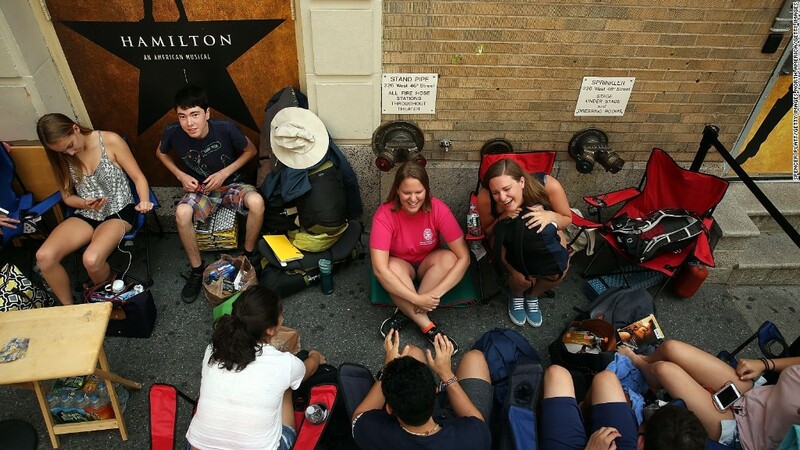 On Tuesday, teenagers from schools with a high percentage of lower-income students will get to see Lin-Manuel Miranda's hip-hop musical "Hamilton" in New York, Boston and the Bay Area. Most of the kids at Oakland's Aspire Golden State College Preparatory Academy didn't know anything about Hamilton — the historical figure or the musical —before they met for the class after school. "The fact that he's an immigrant, that's the only relatable thing. They seemed pretty far away," said Vicente Trujillo, 16. Google.org (GOOG) stepped in to make the history seem much closer. It contributed an $800,000 grant to send the students to see "Hamilton" live. 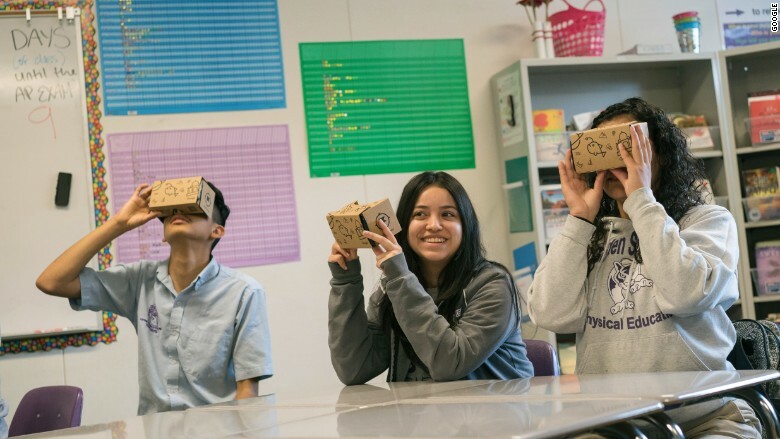 The company also whipped up six new Google Expedition programs so students can visit related historic sites in virtual reality using Google Cardboard viewers. Google Cardboard is an inexpensive VR viewer that works with most iOS and Android phones. On Monday, a room of 28 middle- and high schoolers at Aspire got to try out one of the new lessons. Google brought in the loaner viewers and smartphones. Their faces pressed against the small cardboard boxes, the students whipped their heads around in sync and let out the occasional "whoa!" They saw the exact spot where Aaron Burr shot Hamilton, the church where Hamilton was buried, Burr's home, Independence Hall, and a map of 1775 New York City among other sites. Other virtual reality tours cover Hamilton's tempestuous love life, the creation of the modern banking system, and his role in George Washington's presidency. The Gilder Lehrman Institute is also putting exhibits of letters and other artifacts online for anyone to view. "It's been really exciting to see history come alive," said Aspire Assistant Principal Joanne Lin. She thought the thought the kids would be able to relate to Hamilton because he was a scrappy immigrant. Nearly all the students in the program qualify for free or reduced lunches, and most would be the first in their families to go to college. For many, English is their second language. "I know that sometimes American history can seem completely disconnected from reality," said Google's Suzanna Bobadilla, who led the virtual tour. "We're hoping to humanize these people." Bobadilla guided the kids through the historic locations while trying to make the events relatable to her smartphone-loving audience. She compared revolutionary era pamphlet wars to trending topics on Twitter (TWTR) and a letter written to Eliza Schuyler Hamilton to a text message. "It's hard to read about in a textbook, but this was an experience," said 16-year-old Alexa Medina. For the big finale to the month-and-a-half lesson, all of the students (and some very excited chaperones) will see "Hamilton" live. They'll even watch some of their own on stage. Earlier in the program, students had come up with their own songs and poems based on the founding fathers. Three of the Aspire students will perform a song they wrote about John Adams onstage at San Francisco's SHN Orpheum Theatre before "Hamilton" starts. Kids from fourteen schools in the Bay Area were chosen to perform. Lin, the Aspire principal, said she could see using Cardboard for more lessons in the future. She thinks it would be a great way to let students tour colleges they can't afford to see in person, for example. The students overwhelmingly said they'd like to use virtual reality to visit war zones. And maybe one day, kids who can't make the live show can even watch "Hamilton" the musical in virtual reality.